The online market will be closed this week. Spring is the absolute busiest time on the farms & I’d like to give everyone a breather. At the same time, happy Springtime hens have us overflowing in eggs. If you would like to place an egg-only order for a quick exchange this Thursday at 4:30, please call or text me at 903-440-5392 and specify how many dozen & which producer. I’ll see the rest of you next week or come visit our Saturday market 8-noon…lots of goodies there too! Good morning I do apologize for the late notice for such late notice, lmao currently in the British Virgin Islands due to sudden family death but will be back to open next week. Thank you for your patience. Dawson Local Harvest: Time to order! We’ve got ground goat and goat sausage on the market this week, as well as a few new offerings from Cultured Tradations! Order now through 5 pm Thursday April 11th for Saturday April 13th Pickup, (or contact me if you want a different day, we do have some flexibility.) Again this week Friday may be best or early Sat Morning. 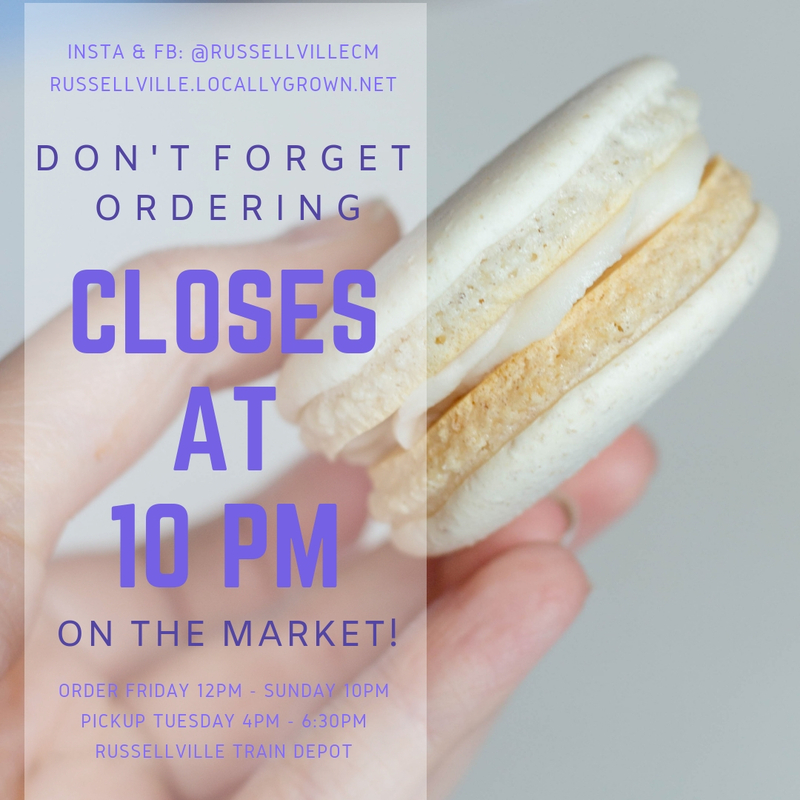 The Market Closes at 10PM! We have Kale from Green Acres Atkins, T-Bone Steaks from Bluff Top, Local Raw Honey, French Macarons from Kuroki Bakery, Fresh Free Range Eggs, Whole Wheat Pizza Dough, and so much more on the Market this week. Make sure to place your order before it’s too late! The online Market is open for this week’s orders. This week’s pre assembled CSA bag will contain: Spring Mix, Collards, Beets, Kale, Parsley, Romaine, Basil. Our farm’s busy season has begun! The Sun shines longer by the day and warms the waking Spring soil of Princeton’s Pleasant Valley. The likelihood of frost dwindles marking the time which it becomes safe to plant outdoors. Between Thursday and Friday alone the team transplanted over 4500 plants from the greenhouse to the first of our outdoor fields. These vegetables, some familiar and others new, will be yours to choose from on the online market. The following weeks will be nonstop planting, seeding, and turning over winter crops for summer ones. Please be patient with our selection during the transition time. A vegetable we’d like to highlight this is Collard Greens. Historically an important culinary staple of the deep South, Collards are similar in taste and preparation to Kale. The primary difference is that Collard Greens have significantly larger leaves that lack the curl or savoying (the term for the bumpy texture on Tuscan Kale) typical on Kale varieties. Botanically, the plants are the same species. Like all leafy Brassica family plants, Collards are excellent source of Vitamins A, C, and K. If you’re looking for a bit of adventure this week, we encourage you to try swapping in Collards for Kale in a recipe. A crispy, healthy twist on an old Southern favorite. Prepare collard leaves by washing, patting dry, and removing leaves from stem (cut stem from the middle of the leaf all the way to the top). Tear leaves with hands into 3-4 inch pieces. Toss with olive oil or spray with Misto sprayer. Use just a light coat, too much oil will leave your chips soggy. Lay in a single layer on parchment paper. If needed, use two baking sheets to prevent overlapping. Bake for 7 minutes, then flip leaves. Bake for 5 minutes more, then check leaves. Remove any that are crispy, return any that are limp to the oven. Be careful not to overcook or they will turn brown and bitter. Sprinkle collard chips with salt or other preferred seasonings. Recipes will be added under this tab weekly, creating a helpful and convenient resource to help you cook the vegetables we grow. If you have a great recipe for our vegetables, we invite you to share it with us. We may put it on the site to share with the rest of the CSA community! As always, we thank you for your support. You are helping us create a strong sustainable farm for the West Kentucky region. We hope to be an asset to our community. Good afternoon, and Happy Sunday on this warm Spring day! Have a great day, and we’ll see you Wednesday. Foothills Market is open for another week of shopping for fresh, local food. When you shop at Foothills, you are supporting local farmers dedicated to sustainable practices. This means you’re getting food that’s not only good for you, but that is also good for the earth. Shop the market between now and Wednesday at 5:00. We’ll have your order ready for pick-up on Thursday afternoon.